An army of winter staff and vehicles are continuing to work relentlessly with efforts to keep Scotland moving during this brace of cold weather. With around 1800 vehicles and 3500 staff, local authorities and Transport Scotland's operating companies are working around the clock to keep roads as free from snow and ice as possible. Those efforts are backed up by staff at Traffic Scotland and Traveline Scotland who are doing all they can to keep travellers informed. Transport Minister, Stewart Stevenson said: "The Herculean efforts by all those involved in winter service up and down the country is to be highly commended. "We can assure the public that men and women are working are working round the clock in often very difficult circumstances. While this Government and its partners are doing all they can the public must play their part too by ensuring they keep up to date with all the available information and only making essential journeys if the current weather continues." Journey planning information is available at Traffic Scotland and Traveline Scotland; I-phone users can download a free travel app that gives them access to all this information on the move. The Scottish Government has activated its Ready Winter section of the website which contains practical advice and simple steps for people including weather and travel advice. Transport Scotland and its partners stand ready to face winter head on according to Transport Minister Stewart Stevenson. The Minister was speaking from Leith Docks as he witnessed the delivery of almost 25,000 tonnes of treatment salt arriving in Scotland. “The Scottish Government, councils and other key services across Scotland pulled together last year to deal successfully with the coldest winter since 1914. “We are confident that we have planned well ahead with our operating companies and local councils to keep Scotland moving during this brace of cold weather. “While there is no suggestion yet that we will face similar conditions to last winter, we have ensured lessons learned are already being put into practice as can be seen here at Leith today. With the arrival of this extra salt to supplement our existing stocks, over two months supply at heavy use, we are well placed to tackle winter head-on . While the Scottish Government is doing all it can to keep Scotland moving, drivers and passengers are urged to play their part by making informed travel choices. Realtime journey planning information can be found on the Traffic Scotland and Travelline Scotland websites. Fifty new low carbon vehicles will soon join the Scottish Bus Fleet thanks to £4.4 million grant funding awarded this week to six bus operators across Scotland. Stagecoach Scotland West and East, Lothian Buses Ltd, MacEwens Coach Services, First Glasgow and COLCHRI Ltd will all benefit from the Scottish Green Bus Fund which provides help with the up front costs of buying new low carbon vehicles. This mix of both large and small bus operators will result in the new low carbon buses operating across Scotland with some providing dedicated routes showcasing the new green buses. These new buses are expected to deliver an average reduction in CO2 of around 21 tonnes per year and 300 tonnes over their life-cycle. "I’m delighted to announce the successful bids from the £4.4m Scottish Green Bus Fund. “This investment will offer a greater opportunity for the purchase of low carbon vehicles and stimulate demand for green technology, moves we must make to meet Scotland’s tough targets to tackle climate change, and decarbonise almost all road transport by 2050. Applications for the fund, which opened in July and closed in October, were so high that the scheme was oversubscribed. All successful applicants must place their orders by 31 March 2011. Banff & Buchan MSP Stewart Stevenson has congratulated Macduff Old Folks’ Association for winning a bonus award from the ITV ‘People’s Millions’. Buchan Street Hall was one of the contenders for the ITV ‘People’s Millions’ which saw the facility go head-to-head on the STV News on 22 November against another good cause from the STV North region. 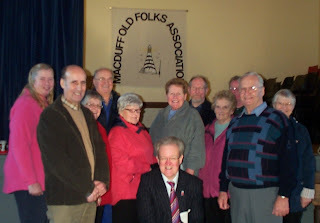 The MSP met with committee members from the Macduff Old Folks’ Association, who own the hall. Whilst losing out to Keig Village Hall in the telephone vote, the hall committee have been informed they have won the bonus award and will receive the full amount they were seeking. “I am absolutely delighted for the Macduff Old Folks’ Association and the hall users, of which there are many. The Buchan Street Hall is a great community facility which I know from my visit is well-regarded locally by the various hall user groups. “The Committee have some excellent plans for refurbishing and upgrading the hall which will bring it right up to standard, not least of which will see improvements to the kitchen facilities. Banff & Buchan SNP MSP Stewart Stevenson has welcomed comments made in the Scottish Parliament Justice Committee indicating that ACPOS (the Association of Chief Police Officers) will commit to maintaining the extra 1000 police officers put in place under the SNP Government, of which 183 are in Grampian. Since the SNP came to power in 2007 crime has fallen by 30% and police numbers have risen from 1374 to 1557 across Grampian. “It is very encouraging news that the additional 1000 police put on our streets under the SNP Government look set to stay. “The safety of our communities is of paramount importance and the extra 183 police officers in Grampian have made a major contribution to the 30% drop in crime since the SNP came to power. “The SNP has put funding from Government in place to ensure local authorities have the ability to limit the impact of Westminster cuts on Scotland’s police. While police boards had made predictions of a 10% cut this year, the actual fall will only be 2.6% because of the priority the SNP has given to making Scotland safer. Banff & Buchan SNP MSP Stewart Stevenson has commented on the early onset of winter with snow hitting the region. “This November cold snap is a reminder of the extremely harsh winter that we faced last year and which gave people weeks of strife with several feet of snow lying in many areas. “Gritters and snow clearing equipment have already been out in force and I know that salt stockpiles are healthy across the country after the problems last year’s shortages caused. Climate Change Minister Stewart Stevenson is to join with the UK to present a united case for greater international action to combat climate change. Mr Stevenson will be part of the UK delegation at the United Nations Climate Change Conference in Cancun to highlight the significant job and investment opportunities of a low carbon economy and press for global action. "Scotland has the most ambitious climate change legislation anywhere in the world, and we are now more than half way to reaching that world-leading 2020 emissions reduction target. Our Low Carbon Economic Strategy highlights that we could almost double the number of jobs in the low carbon economy to 130,000, while attracting billions of pounds of new investment. "Scotland is rightly seen internationally as a leader in the transition to a low carbon future. Our success in seizing the opportunities from tackling climate change is recognised by the UK Government and I will join the UK Secretary of State for Energy and Climate Change and his delegation in Cancun to demand greater ambition in international action. Tackling climate change is driving new thinking, new technologies and new investment in Scotland. A low carbon economy is good for the environment and brings significant opportunities for new green jobs. That's the message I will be taking every opportunity to press - a low carbon transition is sensible, sustainable and ultimately unavoidable. "The UK Secretary of State has talked of getting the world 'within shouting distance' of a deal and the Cancun talks must make progress towards an ambitious, legally binding deal. Yet Scotland and other developed countries must also help the developing world to mitigate the effects of a changing climate. We share a desire with the UK to identify ways to help developing countries adapt to climate impacts, a position which supports our overall approach to international development and desire to see developing countries build a low carbon economy suited to their own strengths." "It is great news that Scotland will be part of the official UK delegation. After all, Scotland does have the world's most progressive climate change law. We hope that Scotland's action on this vital issue can act as an example for other nations to follow. We need nations to set a strong foundation for securing a global deal in South Africa next year. That deal must keep any global temperature rise well below the danger threshold of 2 degrees centrigrade." There can be no argument that 2010 has been a considerable year for Lothian Buses with five nominations at the prestigious UK Bus Awards and a £12 million order confirmed to extend the fleet by a further 60 new buses over the next 2 years. All this and now to illustrate the Company’s commitment to providing a first class service for Edinburgh and Lothian residents Lothian Buses announces upgrades to the Night Bus service. While many other towns and cities the length and breadth of the UK are seeing cuts made to their night bus services Edinburgh is one of the very few to see its network expand. Residents in the north of the City will now have access to a brand new night route, the N11 which will operate between Haymarket, Leith Street, Leith Walk, Pilrig Street, Newhaven & Western Harbour. Meanwhile the N16 is being reintroduced on weekday nights to complement the exceedingly popular weekend N16 service. "The Scottish Government has some of the most ambitious climate change targets in the world and if we are to meet them we must encourage people to get out of their cars and onto public transport. "The expansion of Lothian Buses Night Bus network is a very good example of a bus operator responding to the demands of passengers and offers people enhanced opportunities to use buses." "Lothian and Borders Police is committed to making sure that those who live, work, and visit the Capital do so safely and using Night Buses is a good way to do this. "Edinburgh is a safe city, and we will continue to work in partnership with Lothian Buses and other partners to ensure that visitors and residents alike enjoy the safe and welcoming Edinburgh experience." To support the changes Lothian Buses will also launch NIGHTBUSES.com - a dedicated website offering night bus users access to timetable and fare information. The website is accompanied by a new advertising campaign to be featured on the buses and online. The £5.5m construction contract will significantly improve safety and efficiency on a key Ayrshire route said Transport Minister Stewart Stevenson during a visit to the site today. The A77 Parkend - Bennane scheme will provide dedicated overtaking opportunities in both directions for nearly 2 miles (1.8 miles/ 3km), just north of Ballantrae. The A77 links the west coast ports to the rest of Scotland and this project is one of a number of upgrades on this key route. "The construction of the scheme on this lifeline route which links our west coast ports to the rest of Scotland marks another milestone in our ongoing investment in the A77. "On completion, this project will provide better overtaking opportunities for A77 traffic, meaning more reliable and safer journeys for local communities and tourists, as well as freight traffic. "Through this investment commercial visitors and tourists will see that Scotland is open for business - supporting long term sustainable economic growth across south west Scotland and beyond." The contract to build this Transport Scotland funded project was awarded to RJ McLeod (Contractors) Ltd . The 86 mile long A77 is a main link for south west communities and businesses, and this section of the route carries up to 3000 vehicles a day. Project completion is anticipated in spring 2011. Banff & Buchan MSP Stewart Stevenson has welcomed the fact that funding for a replacement prison in Peterhead and the Aberdeen Western Peripheral Route has been protected in the SNP Government’s budget. The Scottish Government has been forced to make previously unprecedented levels of spending reductions as a result of Westminster cutting Scotland’s budget for next year by £1.3 billion. Despite this, however, funding for HMP Grampian in Peterhead and the Aberdeen Western Peripheral Route has been maintained, reflecting the overwhelming need for these projects in the North East. “This budget has forced some extremely tough decisions upon the Scottish Government as a result of the savage cut of £1.3 billion in this year alone imposed by Westminster. Nobody relishes having to make these hard choices, but our hands are tied by the continued lack of real financial powers for the Scottish Parliament. “Yet despite these difficult times, I am delighted that the SNP Government has been able to keep the funding for a new prison in Peterhead and the construction of the AWPR in place. We understand just how important these projects are to people in the North East and know that their construction must go ahead. “The recent publication of the inspection report into Peterhead Prison again underlined the fact that its facilities are simply not acceptable as part of a modern prison system. The need for a new prison in Peterhead is unquestionable and I welcome the fact that the Scottish Government is standing by the decision to construct a replacement. “Meanwhile the AWPR, which was beset by delays and prevarication under previous administrations, remains a key priority for the economy of the region. The continuation of funding for its construction is a clear statement that the SNP understands just how much people in the North East are crying out for the AWPR to be built. Scotland’s route map to cut emissions every year was laid in Parliament today. The RPP shows that Scotland is on track to deliver a 42 per cent cut in emissions by 2020 compared to 1990. But that the EU and UK must follow Scotland’s lead and set tougher targets in line with global climate change need. Today’s report also presents additional options to drive emissions down and ensure Scotland’s annual targets can be met each year to 2022. “Our world-leading targets, to reduce emissions by 42 per cent by 2020 and by at least 80 per cent by 2050 are driving new thinking, new technologies, new solutions and new investment. That will ensure Scotland is an early adopter at the forefront of a sustainable, modern, low-carbon economy. “A range of policies and proposals have been identified in this draft RPP that continue momentum in 2011-12 and show how the annual targets can be met each year to 2022. Other countries are facing similar challenges, and Scotland can be a pioneer and seize this opportunity to demonstrate how a responsible nation can establish an economic advantage through our approach to tackling climate change. “This report demonstrates that existing and identified Scottish policies deliver the required 42 per cent reductions in greenhouse gas emissions by 2020, and is to be welcomed. The 2020 Group urges Government to translate this report into a rolling programme of policy delivery. The RPP is required under the Climate Change (Scotland) Act to set out proposals and policies for meeting annual emissions reductions targets from 2010 to 2022.
the Draft Electricity Generation Policy Statement (published on 17 November), which provides evidence on recent important developments in Scottish electricity generation. the Public Engagement Strategy (to be published by the end of the year), which will explain our approach to informing people about what they can do to help Scotland take action on climate change. The Scottish Government is to take forward a major new pipeline of transport, education and health infrastructure projects, worth up to £2.5 billion through the Non-Profit Distributing (NPD) model. Faced with a reduction from Westminster in capital budgets for 2011-12 of a quarter, Ministers are mitigating this and maintaining continuity of capital investment plans. The 2011-12 Draft Budget proposes major investments to support national infrastructure priorities, including initial work on the new Forth Crossing, investment in the South Glasgow Hospitals - both to be delivered through traditional capital funding - and Scotland's Schools for the Future building programme. Major transport projects with a capital value of £1 billion - the Borders Railway project (£230-£290 million); upgrade of the M8 Baillieston to Newhouse, M74 Raith Junction and M8, M73 and M74 network improvements (approx £320 million); the new Aberdeen Western Peripheral Route and A90 Balmedie upgrade (£350-£450 million). Education projects with a capital value up to £750 million - specific projects within Scotland's Schools for the Future programme, subject to the agreement of local authorities (£400-£500 million); improvements to the further education college estate at Kilmarnock and Inverness (around £100 million); modernisation of the Glasgow college estate, subject to the conclusion of a robust and affordable business case (approx £200 million). Health projects with a capital value up to 750 million pounds - the Royal Sick Children's Hospital and Department of Clinical Neurosciences in Edinburgh (approx 250 million pounds); revenue support to finance projects through the hub initiative (200 million pounds approx); individual hospital projects, health centres and mental health facilities across Scotland (up to 300 million pounds). "Capital investment is undoubtedly an essential driver of productivity, competitiveness and long-term economic growth. The most recent GDP figures for Scotland indicated strong growth in the construction sector - something put at risk by the 800 million pounds reduction in our capital budget imposed by Westminster, which threatens some 12,000 jobs in Scotland. "We are determined to mitigate the impact of these severe Westminster cuts by using all available levers to sustain investment in vital infrastructure projects, including transport, education and health projects. "Since 2007 the Non-Profit Distributing (NPD) model has been the preferred option for revenue financed projects in Scotland and using the NPD model to deliver a pipeline of new projects - including the Borders railway, specific projects within Scotland's School's for the Future Programme and individual hospital projects - is an affordable and effective way of delivering capital expenditure despite sharply falling budgets. We are providing vital support to Scotland's construction industry, jobs and public services. The Scottish Futures Trust, set up to deliver better value for money for infrastructure, will play a central role in this programme. "NPD is a fairer form of finance than PFI, enabling private sector participation and expertise to be utilised in delivering public infrastructure, but setting a cap on the profits that can be made, avoiding the kind of excessive returns and poor taxpayer value we have seen in the past." 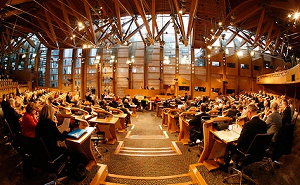 The Draft Budget 2011-12 can be viewed at http://www.scotland.gsi.gov.uk/budget. The Scottish Government's capital budget will fall by 800 million pounds in cash terms next year, compared to 2010-11. This is a real terms cut of 26 per cent. The pipeline announced today follows a number of NPD projects which have entered procurement, been given approval or reached financial close since 2007. For example, the Aberdeen City Schools NPD, NHS Tayside Mental Health Development NPD and Moray Schools projects - worth a combined 255 million pounds - are all currently in construction. The NPD model aims to retain the benefits of revenue finance such as optimal risk allocation between the public and private sector partners and performance based payments while removing the potential for excessive profits that were seen under some of the original PFI deals. enhanced stakeholder involvement in the management of projects no dividend bearing equity capped private sector returns The NPD model eliminates uncapped equity returns which were a feature of PFI projects. Any operational surplus generated is reinvested in the public sector in accordance with priorities agreed with the contracting authority. Stakeholder involvement in the NPD model is ensured through a Public Interest Director, helping to create a more stable partnership between the public and private sector. Banff & Buchan MSP Stewart Stevenson has highlighted the praise for staff and management at Peterhead Prison contained in Her Majesty’s Chief Inspector of Prisons for Scotland’s report. The report criticised conditions at Peterhead, particularly in terms of hygiene, and condemned the continued practice of emptying chemical toilets in a form of slopping out. “It is an important fact that this inspection report rightly recognises the high standard of prisoner care that staff at Peterhead Prison continue to provide. The report inevitably raises concerns about the prison facilities, but that is of course part of the reason why a replacement prison in Peterhead is to be built. “Despite the challenge posed by the conditions at Peterhead Prison, prison staff are praised for their dedication in the report which found 16 examples of good practice. Although there is always room for further improvement, this is a positive acknowledgement of their efforts. “It is important that entirely understandable concerns about Peterhead Prison’s conditions and hygiene are not allowed to overshadow the praise that the staff and management have rightly received. It does however confirm that the SNP Government’s decision to build a new prison in Peterhead was the right one to take. Cabinet Secretary for Justice Kenny MacAskill will today announce plans for a new scheme aimed at highlighting the responsible and reputable companies within the taxi and private hire car trade. The announcement - which will allow customers to make an informed choice about their transportation provider - will be made as Mr MacAskill addresses the first ever summit in Scotland to discuss the threat that serious organised crime gangs pose to the trade. The summit - organised jointly by the Scottish Government, COSLA and ACPOS - will bring together law enforcement and local authority representatives to share intelligence and information to help thwart gangsters intent on using the trade as a front for money laundering, drug dealing and other serious criminal activities. The development of a taxi accreditation scheme - membership of which would provide reassurance to customers and the wider public that firms had met a number of key criteria - will draw on the expertise and success of other successful accreditation schemes such as the Security Industry Authority's Approved Contactor Scheme. "The fact is that many of Scotland's criminal gangs use - or try to use - a number of respectable businesses as a front for serious criminal activity. "The taxi or private hire car trade is not alone - but there is plenty of evidence to suggest that it is particularly vulnerable to money laundering given the nature of its business transactions. "We want to protect the integrity of the taxi and private hire car trade. We want to ensure that only legitimate firms get business, whether it be through contacts with the public or private sector, or from hard-working individuals. "Today's summit will be a key part of the implementation the Serious Organised Crime Strategy and will help to raise awareness amongst participants of the existence and scale of organised crime groups within the taxi and private hire car industry and will provide a better understanding of the extent to which criminality within the trade is recognised by licensing authorities as an issue across Scotland. "The development of a taxi industry accreditation scheme is the kind of measure that would provide reassurance to customers about the people they are doing business with, while ensuring hard-working, law abiding taxi drivers are not being driven off the road by rogues with links to organised crime." Transport Minister Stewart Stevenson will also give the closing address at today's summit. Banff & Buchan MSP Stewart Stevenson paid a visit to the Buchan Street Hall in Macduff yesterday to hear more about the hall’s bid for funding as part of the ITV ‘People’s Millions’. Buchan Street Hall is one of the contenders for the ITV ‘People’s Millions’ which will see the facility go head-to-head on the STV News on 22 November against another good cause from the STV North region. The MSP met with committee members from the Macduff Old Folks’ Association, who own the hall. “The Buchan Street Hall is a great community facility which I know is well-regarded locally by the various hall user groups. The Hay Memorial Hall in Cornhill is also in the running and it will feature on the STV News on 25 November. Transport Minister Stewart Stevenson has announced an additional £1 million for the Scottish Green Bus Fund on the day the Scottish Government published plans to capture the enormous opportunities the low carbon economy offers. The fund - which has already benefitted from a £3.4 million investment - provides bus operators, local authorities, and regional transport partnerships with funds to help with up front costs of buying low carbon buses. "I’m delighted to announce another £1 million for the Scottish Green Bus Fund to further reduce transport emissions. This comes on the same day as we publish our ‘Low Carbon Economic Strategy’ which outlines plans to create new green jobs and seize the opportunities the global low carbon market offers. “To meet Scotland’s tough targets to tackle climate change, we must decarbonise almost all road transport by 2050. This extra investment will offer a greater opportunity for the purchase of low carbon vehicles to enter the Scottish bus fleet as well as help stimulate demand for green technology in Scotland. The Scottish Government expects to announce the successful bidders for the Scottish Green Bus Fund in the coming weeks. Stewart Stevenson, Minister for Transport, Climate Change and Infrastructure today announced the appointment of the board member with Scottish Interest to the board of Passenger Focus (previously known as Rail Passenger Council). James King has been appointed to the board of Passenger Focus following an open competition. The appointment will be for four years and will run from 15 November 2010 until 14 November 2014. The post is part time and attracts an annual remuneration of £16, 090. Mr King was first appointed to this role in 2005. He was re-appointed for a period of one year in 2009 and was also re-appointed to the British Transport Police Authority board in July 2008. He has also previously served as the convener of Passenger View Scotland (PVS). Banff & Buchan MSP Stewart Stevenson will visit Buchan Street Hall, Buchan Street, Macduff on Monday 15 November at 11.00am. Buchan Street Hall is one of the contenders for the ITV ‘People’s Millions’ which will see the facility go head-to-head on the STV News on 22 November against another good cause from the STV North region. The MSP will meet with committee members from the Macduff Old Folks’ Association, who own the hall. Banff & Buchan MSP Stewart Stevenson has hit out at Scotland’s opposition parties after they gutted proposals to introduce a minimum price per unit of alcohol from the final stage of the Alcohol (Scotland) Bill which passed through the Scottish Parliament yesterday (Wednesday) evening. Earlier this week, 165 experts from health, justice and other bodies – including former Labour First Minister Henry McLeish – all backed the Scottish Government’s proposals for minimum pricing. Alcohol costs the Scottish economy £3.56 billion every year in, the equivalent of £900 for every adult in Scotland, with massive bills for the health sector and policing. One in twenty deaths in Scotland are attributable to alcohol and half of all offenders in Scotland were drunk at the time of their arrest. “Scotland’s political parties today had the opportunity to make real inroads into tackling Scotland’s harmful relationship with alcohol by being responsible enough to put the needs of people in Scotland first and backing minimum pricing. Shamefully, they failed in that responsibility and opted to put party politics first. “Health professionals, the police, the licensed trade, the Church of Scotland and even Tesco and Tennents all came out in support of these proposals. The overwhelming consensus has been in support of these measures, yet opposition politicians have simply stuck their fingers in their ears and refused to pay heed. “The effects of Scotland’s relationship with alcohol costs the Scottish economy £3.56 billion every year and the link between the price of alcohol and its rate of consumption is indisputable. Minimum pricing has never been a silver bullet, but addressing the price of alcohol is an essential part of successfully affecting how much alcohol Scotland consumes. By removing minimum pricing from this legislation, opposition politicians have gutted it of its most important measure. A ground breaking ceremony marking the start of the £10.4m dualling scheme on the A9 was undertaken today by Transport Minister Stewart Stevenson. The scheme at Crubenmore on the A9 will see the construction of a 3.2 km (approx 2 miles) extension to the existing dual carriageway near Etteridge on this crucial link to north Scotland. 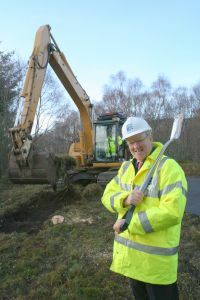 “I am pleased to be undertaking this ground breaking ceremony marking the latest section to be improved as part of the A9 Route Action Plan recommendations. “The A9 is a vital link to north Scotland and the Scottish Government is committed to dualling this route, from Perth to Inverness, on a phased basis. The A9 Crubenmore Dual Carriageway Northern Extension is one of a number of improvement schemes recommended for development to help achieve safer operation and more reliable journey times for the A9. The scheme will form a 3.2km extension to the existing 1.6km of dual carriageway giving additional guaranteed overtaking opportunities in both directions. This will also reduce journey times and the number of convoys. It is anticipated the scheme will be complete in late summer 2011 and will support businesses, communities and tourism throughout Scotland by improving the access to and from Inverness and the Highlands. The A9 is the longest trunk road in Scotland and serves many different users, from remote communities to key strategic traffic between the central belt and the north of the country. The Westminster and Scottish Parliamentarians representing part of Scotland’s top whisky-producing county have welcomed the signing of an agreement between the UK and Chinese Government which will ensure much greater brand protection for Banffshire whisky producers. The move comes after First Minister Alex Salmond, himself a Banffshire MSP, led a delegation to China where details of the new protection measures were discussed. The deal essentially means that Scotch Whisky being sold in China will be sold according to the same rules as the UK, ensuring that whisky drinkers are getting exactly what it says on the bottle. 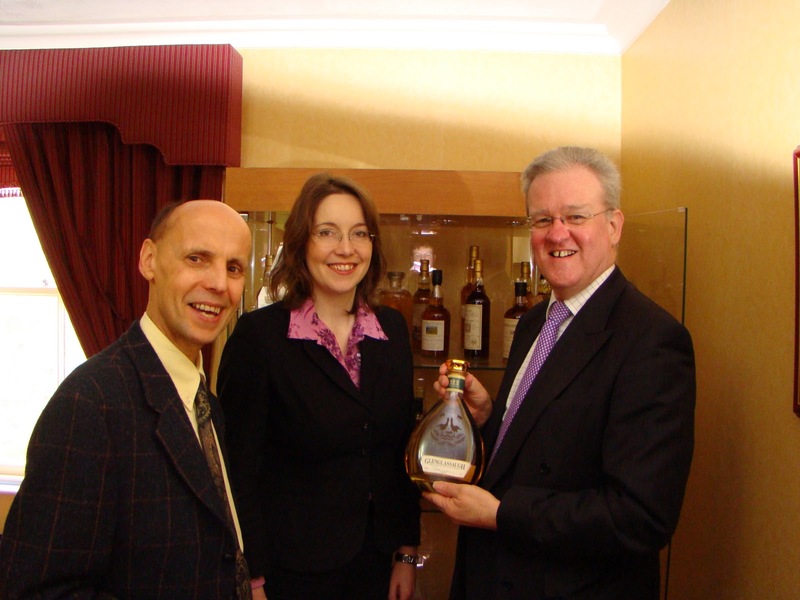 “The whisky industry is a vital contributor to the Banffshire economy and to the wider Scottish and UK economies. “Whisky is one of Scotland’s greatest success stories and is an iconic symbol of our country. This agreement with China will help ensure a bright future for a sector that is vital to Banffshire and Scotland. The first car club to be developed with assistance from a Scottish Government grant is being launched this afternoon by Transport Minister, Stewart Stevenson. The Isle of Bute is the first community to benefit from the grant, which aims to lower carbon emissions through making long term changes to peoples transport habits. Awarded to Carplus, a national charity with experience of similar schemes for DfT, the £200,000 ‘Developing Car Clubs in Scotland’ grant is set to kick start car clubs and low carbon mobility initiatives across Scotland. “I am delighted to mark this occasion with the launch of Bute’s Give Up Your Car Challenge demonstration project and I hope it leads to a longer term Car Club starting on the island. “Bute is the first of a number of communities that have embraced this greener transport initiative and I look forward to seeing these car clubs springing up across Scotland in the coming months. “Carplus has for over a decade supported the development of car clubs. We look forward to sharing our experience and expertise with communities and councils in Scotland". Car clubs improve access to services and complement public transport networks. They also offer a cost effective measure to reduce carbon emissions from transport and we expect them to work well alongside other low carbon transport initiatives. A review by the Transform Scotland Trust has initially identified eight locations taking the first steps towards car clubs, in Aberdeen City, Cupar, Isle of Eigg, Findhorn, Badenoch and Strathspey, Fintry, Dunbar and the Isle of Bute. These sites complement clubs already started by local authorities in Edinburgh (1999) and Glasgow (2010) and it is anticipated that locations will increase over time. The scheme is part of the Scottish Governments Energy Efficiency Action Plan, which is committed to working with local authorities to increase the number of car clubs nationwide. The funding will enable the purchase of car club tools such as booking and billing software and vehicle insurance, and provide a network for car club providers to share knowledge and experience. The Scottish Government will consult on additional measures to be included in the proposed Scottish Water Bill, Ministers confirmed today. The Bill is intended to enable Scottish Water to evolve into a more dynamic organisation better able to exploit its assets and Scotland's water resources to their fullest extent for the continuing benefit of water customers, the environment and the wider Scottish economy. Ministers wish to enhance these proposals with additional measures and the timing of the proposed consultation will enable the Scottish Government to consider the relevance of any new borrowing measures emerging from the UK Government's proposed Scotland Bill. In a letter to the Transport, Infrastructure and Climate Change Committee, Stewart Stevenson said the Consultation will be launched before the end of the month. "The Government has decided to increase its ambition for the Scottish Water Bill, enabling a more extensive role for Scottish Water as a publicly owned company. "In his statement on the legislative programme on 8 September 2010, the First Minister set out his vision for the future of the water industry in Scotland. In preparing the Scottish Water Bill, Ministers have recognised we can be even more ambitious in our plans. "We therefore believe that it would be appropriate to enable a full consultation on our proposals, and will launch the process before the end of this month, prior to introducing the Bill to Parliament. "We will bring forward the full detail of our plans shortly, and of course the consultation will also enable us to test whether any borrowing measures that come forward in the UK Government's Scotland Bill are of any practical use in this or any other regard." The First Minister set out the intention to introduce a Scottish Water Bill in his Programme for Government 2010-11 in September. Further details on the Bill will be available when the consultation is published. Banff & Buchan MSP Stewart Stevenson has welcomed the findings of the Inquiry into Future Fisheries Management which has clearly highlighted the urgent need for control of Scotland’s fisheries to be devolved from Brussels to a regional management structure. It has called for Scotland to take the lead in establishing a pathfinder initiative with other member states to trial a devolved management model. The inquiry also made clear that as the fishing community has a wealth of knowledge in sustainable practices, it is only right that it is given greater decision-making over the way in which the industry operates. However, the report also warned that the Scottish fishing industry is likely to face greater uncertainty than at any time since the early 1980s, making the need for structural change even more urgent. “The publication of this report lends significant weight to the many people who have been calling for fisheries to be taken out of Brussels control and managed on a regional basis. The report quite rightly refers to Scotland’s seas as the 'graveyard for the EU's attempt at management'. “The inquiry has taken substantial amounts of evidence and clearly reached the conclusion that this is the only sensible way forward for the fishing industry. “However, the report has also rightly pointed out that these are deeply uncertain times for the industry. Now that a clear path forward has been identified, the change that is needed must be agreed to as a matter of urgency. Banff & Buchan MSP Stewart Stevenson has welcomed the announcement of a £70 million fund to boost renewables infrastructure in Scotland. Earlier this year, Peterhead was identified as one of Scotland's key sites for renewables infrastructure in Scotland's National Renewables Infrastructure Plan (N-RIP). Peterhead will be one of the ports able to bid for part of the National Renewables Infrastructure Fund to develop its renewables infrastructure in coming weeks. “This funding will help Peterhead make significant progress towards becoming one of Scotland's infrastructure hubs for the rapidly growing offshore renewables industry. I am confident that with the right bid, Peterhead can expect to see a sizeable portion of this fund invested in the area. "Scotland has 25% of Europe's offshore wind and tidal energy potential and 10% of its offshore wave energy potential. The scale of the economic opportunities available is enormous, and with the right investment, Peterhead will be right at the cutting edge of these developments. “This announcement will help to boost the Banff & Buchan economy and create skilled jobs in the area. It is good news for Peterhead and a clear sign of our ambition and support for the economy of Banff & Buchan and Scotland as a whole.